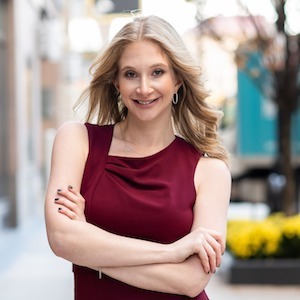 Nicole Friedman transitioned into a career in real estate sales after working as an account manager within the digital advertising industry, an experience that helped her cultivate her talents in communication, client service, creative strategy, and negotiation. Nicole develops longterm relationships by focusing on her clients’ needs and keeping their interests in mind through each step of their process. She also draws on her personal experiences as a homeowner to provide empathetic advice, optimism, and a smooth, positive experience for both buyers and sellers. Nicole’s dedication and work ethic have allowed her to build a significant network of resources and contacts that have proven valuable to clients as they navigate the market. Nicole is a lifelong resident of the Chicago area, having grown up in the northern suburbs and currently residing in River North. She provides expertise in this neighborhood as well as the surrounding regions, and is always prepared to help people explore any market they wish within the city. Nicole enjoys indulging her passion for comedy, using the skills she gained as a Second City graduate both within her work and outside of it, and she is also heavily involved with a number of charity organizations throughout the city.